Figure 7.8. Scheme of the disassembly of the 30S ribosomal subunit achieved by high salt concentration (e.g., by an increased concentration of LiCl in the presence of 5 mM MgCl2; see the text). The first proteins to bind to ribosomal RNA in the course of self-assembly are the core proteins which are capable of binding to RNA independently of each other. In the case of E. coli 30S subunits, these are proteins S4, S7, S8, S15, S17, and S20. Protein S16 binds along with these. 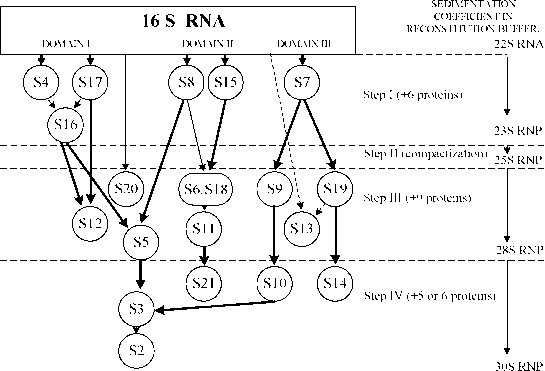 The addition of the six proteins S4, S7, S8, S15, S16, and S17 (step I in the scheme of Fig. 7.9) is a prerequisite for the transition of the intermediate ribonucleoprotein from a less compact to a more compact state (step II in Fig. 7.9). Apparently, it is this transition that requires an elevated temperature during self-assembly. 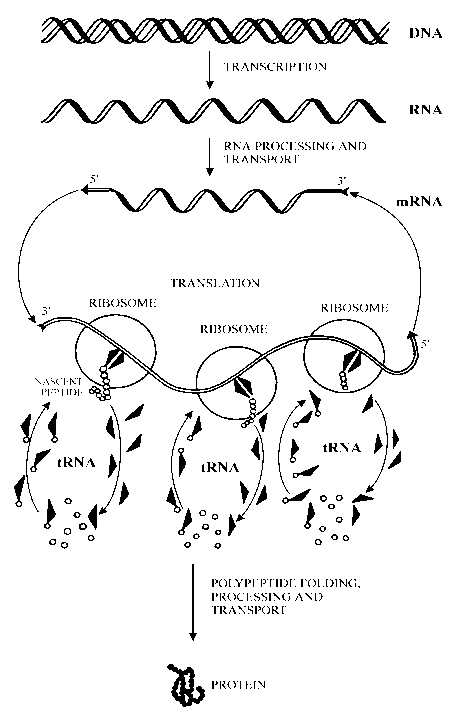 As a result of this transition, the 16S RNA almost reaches the maximal compact state of its overall folding which is characteristic of this RNA within the mature 30S ribosomal subunit.